LED is a totally natural, pain-free method of skin rejuvenation. The LED light interacts with skin cells and stimulates them to produce new collagen and elastin. Studies show the same LED energy can also be used to inhibit collagen formation, which can be helpful in the treatment of scars. In fact, by manipulating the light wavelengths, skin cells can be “turned on and off”. Yellow light LEDs are used for skin rejuvenation. Blue light LEDs are used in the treatment of acne. 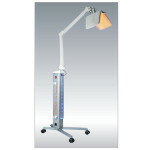 Red light LEDs are used for PhotoDynamic therapy. Other light-based skin therapies such as IPL and laser treatments rely on thermal injury to the skin’s collagen, water or blood vessels to create changes in the skin’s appearance. But LED skin rejuvenation does not rely on thermal energy and the related tissue trauma to effect change. Therefore, patients avoid the potential risks associated with wound healing. – Anti-aging, reduce fine lines and wrinkles, leaving the skin with a healthy glow. – Improve pigments such as aging spots or freckles. – Toning and tightening of face skin – great for mature skin lacking elasticity. – Traumatized skin, such as the pigment lesions or burns caused by IPL treatment. – One device can be used for several different treatments.